The Narmada River Development project, the largest in the world, flows through the three states of Madhya Pradesh, Maharashtra and Gujarat, India and involves the construction of 30 huge dams and the displacement of 25 million people. 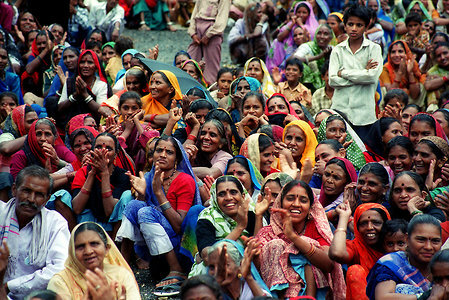 The Adivasi people are living in the shadow of the Sardar Sarovar Dam, the largest of dams. Since construction and the proposed raising of the height of the dam, the rising waters have submerged and continue to destroy the Adivasi's homes,land and livelihood. 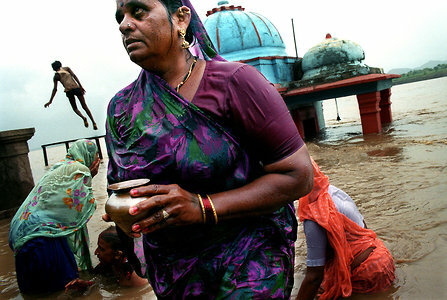 Women bathe and pray next to the half submerged temple at Khoteswar,a village on the banks of the Narmada River. The temple was in use until last year but has since been submerged due to a rise in the water level, a direct result of the building of and raising the height of the Sardar Sarovar Dam, India. Anti-dam activists and tribal women prepare to drown themselves as the monsoon waters rise rapidly, flooding land and homes in Domkhedi village, on the bank of the Narmada river, Maharashtra, India. Women washing themselves and their children in Domkhedi village, on the banks of the Narmada River, Maharashtra, India. 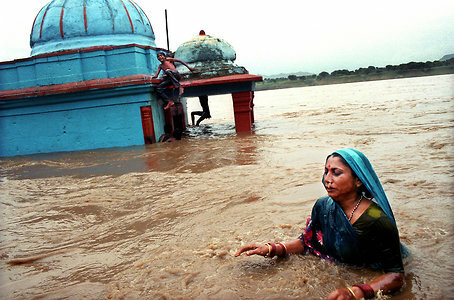 A woman bathes and prays next to the half submerged temple at Khoteswar,a village on the banks of the Narmada River. The temple was in use until last year but has since been submerged due to a rise in the water level, a direct result of the building of and raising the height of the Sardar Sarovar Dam, India. 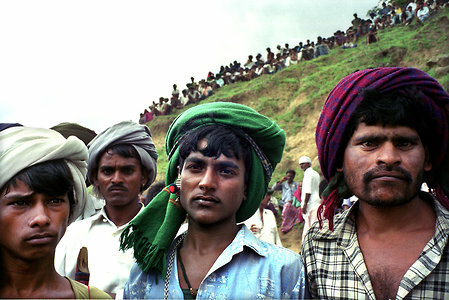 Adivasis tribal men, India's original inhabitants, at Kakrana village which lies on the banks of the Narmada river. The tribal community live off the land, forest and river but face the destruction of their homes and land due to the construction of large dams along the Narmada, the World's biggest water development project. India. 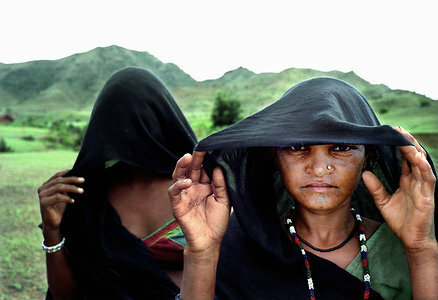 Adivasis tribal women, India's original inhabitants, at Kakrana village which lies on the banks of the Narmada River. The tribal community live off the land, forest and river but face the destruction of their land and homes due to the construction of large dams along the Narmada, the world's biggest water development project. Arundhati Roy, novelist and anti-dam protester on the banks of the Narmada River.